We’ve been playing a lot of poker lately. I’m suprised I haven’t <a href=http://www.bitsmack.com/modules.php?op=modload&name=Comics&file=index&action=comic&id=442>done a comic about it</a> sooner. Over the weekend some of us went to Ohayocon. 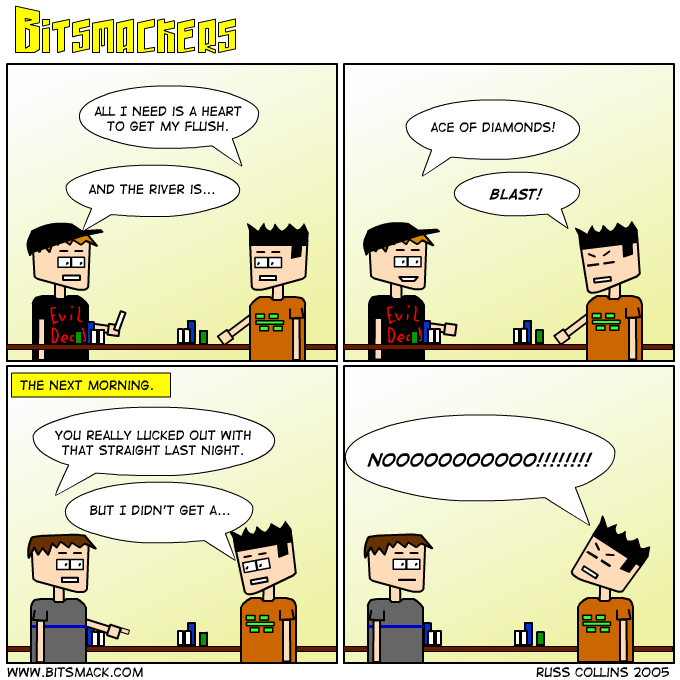 It was bigger than <a href=http://www.bitsmack.com/modules.php?op=modload&name=Comics&file=index&action=comic&id=377>last</a> <a href=http://www.bitsmack.com/modules.php?op=modload&name=Comics&file=index&action=comic&id=378>year.</a> I restrained from buying anything, but we did get a bunch of pictures of people dressed up. I hope to get those pictures up this week. I used my Christmas gift certificates to buy Resident Evil 4. I know I have <a href=http://www.bitsmack.com/modules.php?op=modload&name=Comics&file=index&action=comic&id=338>made fun of the first one</a> in the past, but RE4 is by far the best survival horror game I’ve ever played. The controls are tight, the visuals are incredible and the whole game is better than most horror movies I’ve seen. If you’re like me and never really tried Resident Evil, RE4 is a good place to start.